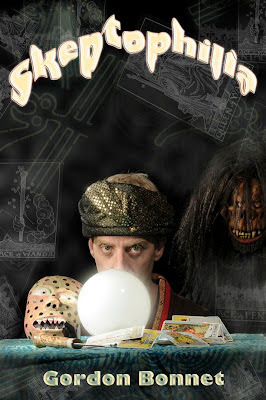 Skeptophilia: Ten days till book release! I'm going to take a brief diversion from our regularly-scheduled analysis of irrational nonsense to do a public service announcement (or shameless self-promotion, depending on how you see it). I will be publishing (for Kindle [Amazon] and Nook [Barnes & Noble]) a collection of essays, the best of Skeptophilia, ten days from now -- it will be available on Friday, June 30, Lord willin' an' the creek don't rise. It will be an opportunity to have all of your favorite essays from this blog in one place. It contains lovely photographs of UFOs, spirits, and animals that probably don't exist, the latter including Bownessie, Japanese Sky Jellyfish, the Beast of Gévaudun, and Florida Skunk Apes. You will find out why I still occasionally get hate mail from a bunch of irate British ghost hunters. You will hear why a pissed off Young-Earth Creationist sent me a three-page long screed in which he referred to me as a "worthless wanker." The collection contains 120 essays, each of them a wry, humorous, and occasionally incredulous look at why people believe crazy, counterfactual nonsense. I hope you'll support my ongoing mission to foster critical thinking, rationalism, and skepticism -- both by continuing to read this blog, and also by buying this book (and reviewing it and recommending it to all of your friends). Okay, that's it for the advertisement, at least for now. Tomorrow, we'll be back to our regularly-scheduled hijinks. If I pre-order will I get a limited edition woo-woo figurine? A Richard C. Hoagland bobblehead.